Clinique Bottom Lash Mascara (£11): I bought this on a whim, It's a brlliant idea and I dont know why this hasnt been done before, A super tiny mascara brush designed to coat just the bottom lashes. Works well at catching all the small lower lashes and coats them to give the effect of longer fuller bottom lashes. Absolutely fool-proof and fuss free. Perfect for someone like me who cant apply mascara to save their life! Boots Botanics Cleansing Balm (£8.99): This is another Botanics recent reformulation although admittedly, I never actually tried the original of this. Although I saw this in store and bought it after seeing Meg mention it in a video. I think it does a fair job at removing makeup and doesn't irritate or aggravate my skin. I really enjoy using cleansing balms as they are gentle and moisturising at the same time. My skin seems to like this so far, I plan to do a full review on this in time! 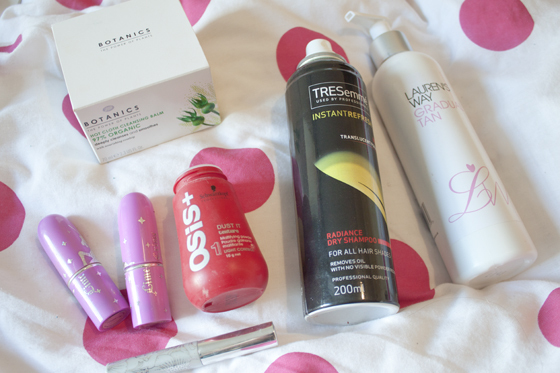 TRESemmé Instant Refresh Dry Shampoo (£4.79)*: I wasn't overly impressed by this dry shampoo. I didn't feel it left my hair as clean as Batiste although it does sort of live up to its claims of being translucent as I don't need to comb through my hair as much after using this. But on my brown hair doesn't come out completely translucent. It is very light though and it doesn't build up compared to other dry shampoo's. Although overall it's average at best and a lot more expensive than similar products on the market that give the same results! Lime Crime Lipsticks ($15.99)*: I was sent this lipstick YEARS ago, even before ETCLLYMLRS came about! I think Lime Crime lipsticks are pretty okay, not worth going out of your way to get hold of though. The formula is non drying and pigmented but they feel quite heavy and suffocating on the lips, most are two coats opaque but this makes them feel very tacky and thick feeling. The shade range is unusual and their packaging is incredibly unique. Might be worth checking out if your more into alternative lipstick shades! OSIS+ Dust It* (£11.19)*: I'm a big fan of this volumising powder despite the fact it leaves my hair feeling like straw on the second day! It mattifies the hair and adds alot of texture and incredible amounts of volume. I typically sprinkle it into my roots and around the crown of my head, fluff up with my fingers and voila, Big hair! Laurens Way Gradual Tan (£13.95)*: I didn't really expect a whole lot from this apart from the fact i imagined it was going to make me a classic Essex orange. My natural tan has started to fade so I thought I'd give a gradual tan a go! It's not horrific, but not amazing either. Probably one just for the TOWIE fans if Im being totally honest! I wouldn't have bought it myself, but it is very natural and applies well and doesn't actually go super orange!